Moving back to the Midlands in 2007, Madi played with various local musicians and covered for a few small local pub bands when they were in need of a guitarist. In 2009 he set up the band “Strumpit” with guitarist Andy Bucknall and bassist Mike Greene. In 2010 Madi was commissioned to write a short piece of music “Vampire Kiss Chase”, for the Brothers McLeod pilot of “The Isle of Spagg”. Madi set up his own trio in 2011, playing a mix of gypsy, jazz, bluegrass and folk roots, but with a definite emphasis on the manouche sound pioneered and made famous by the great Django Reinhardt. 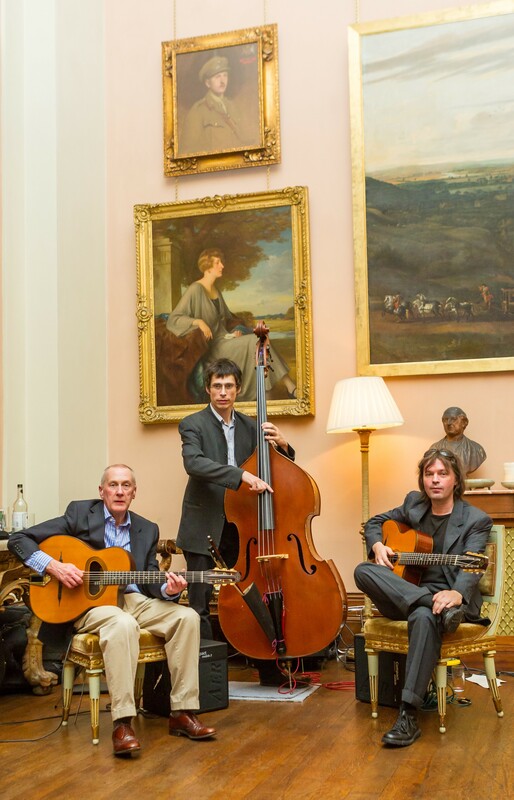 The Madi Stimpson Trio could be seen playing in a range of settings. 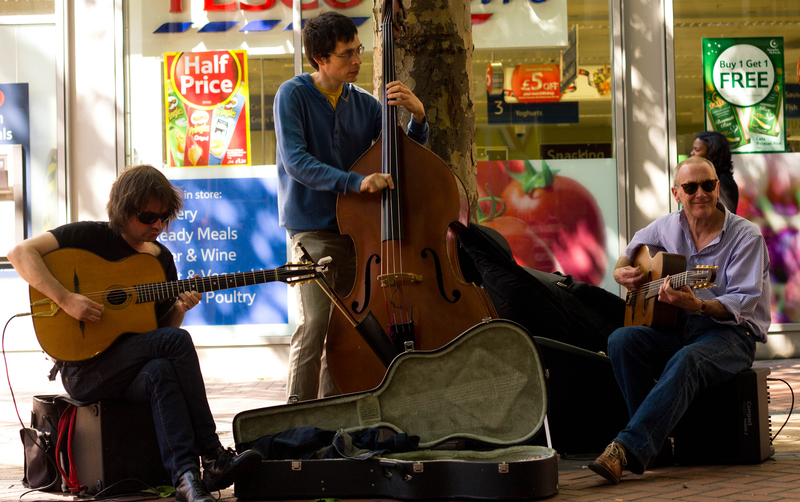 From busking in the streets of Birmingham and playing private parties and small pubs, to more prestigious events such as The Brecon Fringe and Cheltenham Jazz Festivals in 2012. The Madi Stimpson Trio were Madi (guitars and vocals), Michael Lacoult (double bass) and Stuart Neil (rhythm guitar). This line-up finished at the end of 2012. The new line-up for 2013 will feature Vo Fletcher and Gareth Fowler (guitar) and Paul Smith (double bass). Dream a Little Dream – Trio version of this great old classic, featuring Madi (vocs, guitar), Geoff walker (baritone sax) and Marko Miletic (double bass). Turkish Rondo – Trio version of this Mozart tune, featuring Madi (lead guitar) Vo Fletcher (rhythm guitar) and Paul Smith (double bass). Sweet Georgia Brown – Quartet version of this well known jazz standard, featuring Madi (lead guitar), Nick Bryan (rhythm guitar) , Geoff Walker (soprano sax) and Marko Miletic (double bass). Indifference – Trio version of this gypsy accordion waltz written my Tony Moreno, featuring Madi (lead guitar), Vo Fletcher (rhythm guitar), and Simon Smith (double bass). Donna Lee – Quartet version of this great Charlie Parker tune, featuring Madi (lead guitar), Ken Moore (rhythm guitar), Geoff Walker (soprano sax) and Marko Miletic (double bass). Django’s Tiger – Trio version of this Django Reinhardt tune, featuring Madi (lead guitar), Ken Moore (rhythm guitar) and Simon Smith (double bass). Moondance – Trio version of this Van Morrison classic, featuring Madi (vocs, guitar), Alan Mason (electric guitar) and Marko Miletic (double bass). La Gitan – Quartet version of this lovely gypsy waltz written by Tchan Tchou Vidal, featuring Madi (lead guitar), Nick Bryan (rhythm guitar), Geoff Walker (soprano sax) and Marko Miletic (double bass). Swing Gitan – Quartet version of this great Django Reinhardt tune, featuring Madi (lead guitar), Ken Moore (rhythm guitar), Geoff Walker (soprano sax) and Marko Miletic (double bass). Tico Tico – Trio version of this lovely Brazilian samba, featuring Madi (guitar), Alan Mason (guitar) and Marko Miletic (double bass). Douce Ambience – Trio version of this Django Reinhardt tune, featuring Madi (guitar), Gareth Fowler (guitar) and Paul Smith (double Bass).